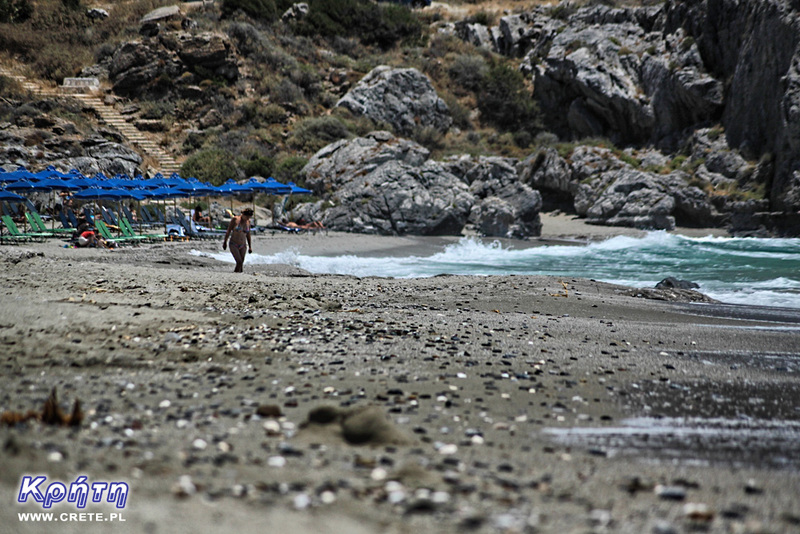 The beach at Damnoni is located adjacent to Plakias - a popular tourist destination. These places are located a short distance from each other, so the route can be covered on foot. Damnoni boasts a wide beach located in a deeply embedded bay, the boundaries of which are marked by two peninsulas facing the sea. Along the shore of a small river that flows into the sea in the western part of the beach, there is a local road where you can leave your car. However, if you plan to come here weekend, you have to reckon with the fact that finding a free place to park the car can take a moment. This beach is quite popular among local Greeks, who are willing to spend here Saturday and Sunday. In these days, there is usually very noisy here, and the road is full of cars parked along both sides of the road. Currently, Damnoni is also a typical small town focused on the service of tourists holidaymakers. In addition to a dozen or so hotels located along the bay and on the hills surrounding it, along the road you will also find several family taverns offering local delicacies. In the western part of Damnoni is an organized beach, where you can rent sun loungers with umbrellas. You will also find changing rooms and showers powered by fresh water. People bored of sunbathing may consider using the services of companies specializing in renting water sports equipment. The central and eastern part of the beach is definitely more calm and less crowded. People who prefer resting directly on the sand will easily find a more intimate piece of beach here. If someone cares about even more privacy or is a fan of sunbathing without clothes, he can go to the neighboring Ammoundi bay. A little further away is the next very lovely and small beach called Skinaria . 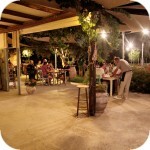 Damnoni is located 35 km south of Rethymno and about 5 km east of Plakias . Overcoming the part of the New National Road constituting the bypass of Rethymnon , in the central part of this section of the road, take the road heading south towards Spili - Timpaki. After about 16 kilometers, there is a fork leading to Koxare. In the distance you will see the Kouartaliotiko gorge behind which the town of Asomatos is located. In this village, turn right heading for the village of Lefkogia. Leaving about 2.5 kilometers behind this village you will find a crossroads with the road that goes directly to Damnoni beach. Mam sentyment do tego miejsca - bo właśnie tam we wrześniu 2008 roku rozpoczynaliśmy naszą już ponad półroczną przygodę z Kretą. Z ciekawostek - pod ramieniem skalnym ograniczającym morze przy plaży Ammoudi od lewej strony jest podwodny tunel - niezbyt długi ale przepłynięcie jego jest pewnym wyzwaniem - kto próbował nurkować w Morzu Śródziemnym domyśli się dlaczego.